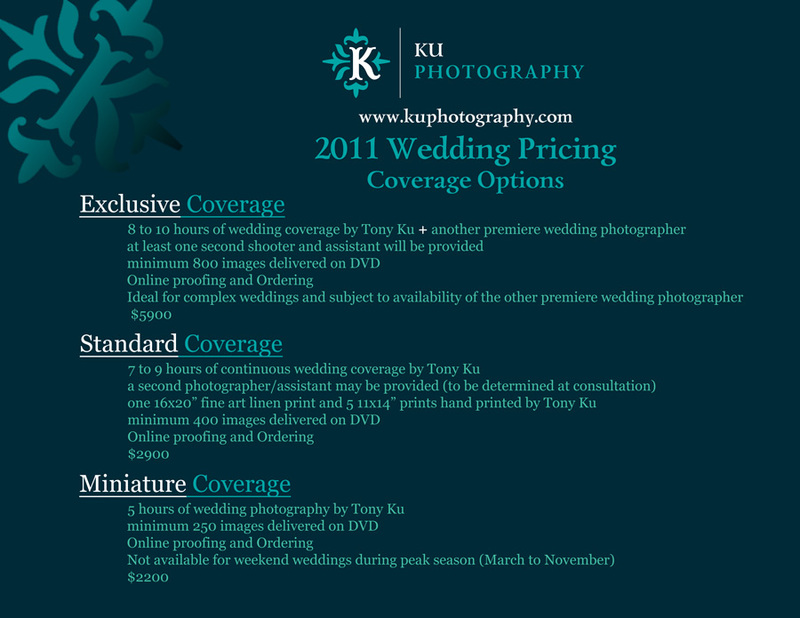 We offer 3 levels of coverage options for 2011 and 2012. You simply select a coverage option that is closest to your needs, then we can build from there. We find that a “standard” coverage would be suitable for 80-85% of weddings. If you need extra hours, please contact us and we will discuss options. For special wedding that requires multiple-days, we can customize it to your needs. Our goal is simply to give you amazing and meaningful images in our wedding coverage that you will want to buy the album after the wedding. We are absolutely confident in our ability to do this for every wedding we photograph – which is why we will not pressure you for commitment toward an album before the wedding day. If you would like to pre-purchase an album with the coverage, the album would be discounted from the retail price. Our albums retail between $1000 and $2500. However, since over 70% of our couples bought the album(s) after the wedding if they didn’t purchase one before, we find it’s easier to just discuss coverage needs and not worry about the added costs of an album. Exclusive coverage is subject to the availability of the other premiere wedding photographer in our very tight-knit group of wedding photographers. We have similar styles and approaches and yet unique in our own ways. Basically, you’re getting two primary wedding photographers at your wedding, plus at least one more second photographer. Portraiture sessions for families, seniors and couples are available – please contact us and we’ll get the process started.